Rome bound: Stephanie Santos will head to Rome next month to participate in the Vatican’s pre-synod meeting. GOLD Coast youth leader Stephanie Santos wants to tell the world’s bishops that despite a sharp drop in the number of young Catholics at Mass, youth are hungry for the truth. Miss Santos has been invited to attend the Vatican’s pre-synod meeting in Rome next month, along with Melbourne Chaldean woman Angela Markas, who will represent Australia on behalf of the Australian Catholic Bishops Conference. 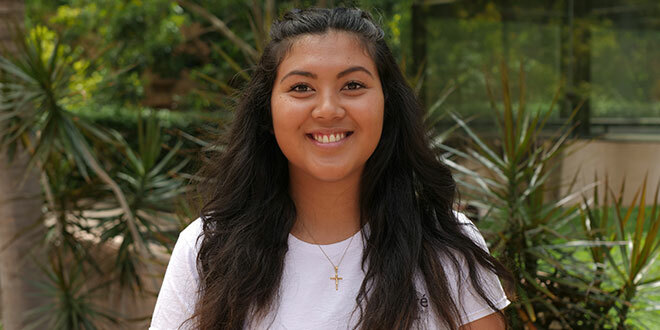 Miss Santos is the youth co-ordinator for the South Coast deanery, incorporating all parishes on the Gold Coast, and is studying a Bachelor of Theology at Australian Catholic University. The university is sending the 21-year-old to Rome with Brisbane campus ministry associate director Mark Lysaght as representatives of members of the pontifical Congregation for Catholic Education, which is responsible for universities, schools, faculties and institutes around the world. Miss Santos will join about 300 Christians from various denominations, including non-believers, from March 19 to 24. The meeting will end on Palm Sunday, which also marks the international World Youth Day. In Rome, Miss Santos hopes to show bishops and other delegates that there is hope and potential for the Church. “I think there has been lots of negativity towards the Church within the past year, with a lot of different things, and it can be really disheartening sometimes when you’re faced with those challenges,” Miss Santos said. “In a positive light I want to let the bishops and the wider Church know there is hope, and so many young people who are hungry for the truth. Through her work co-ordinating youth groups across the Gold Coast, Miss Santos said she knew more young people were leaving the Church after high school because they were not grounded in the faith. She said the Church needed to find ways to support the faith growth of young people before they graduated. “They grow up in a Catholic family and go to Catholic schools, but when they finish they stop coming,” Miss Santos said. “That’s the moment where it’s really hard, getting them in those years and, as a Church, we need to better support them while they are still in school. Miss Santos said her experience showed that young people who were staying in the Church had mentors and were connected to a community of faith. “At the moment being a Catholic is very isolating,” she said. “What keeps them here is community. The 15th ordinary General Assembly of the Synod of Bishops will take place at the Vatican from October 3 to 23 discussing the theme, Young People, Faith and Vocational Discernment. The Australian Catholic Bishops Conference received preparatory documents for the synod and were invited to respond to specific questions in the document. Last year the ACBC commissioned a national youth survey, and released the results in a report in October last year. About 15,000 people filled out the survey, which was was open to young Australians aged between 16 and 29. The report showed that young Catholics living in Australia were finding it harder to live their faith because of increasing pressures from secular society, influenced heavily by social and mainstream media. Low numbers of young people at Mass and other Catholic events also influenced how likely a young person remained in the Church, especially in rural and remote communities. “The fewer young people in the Church, the harder it is to stay involved,” the report said. The sexual abuse scandal in Australia has also left a negative impression on young Australians. On the other hand, the sacrament of Penance was highly regarded as a time to be listened to by a priest and “was recognised as a prime opportunity for … positive encounters”. Eucharistic adoration is also gaining popularity among young Catholics, particularly when the devotion is scheduled at youth camps, retreats and conferences. The full report is available on the Australian Catholic Bishops Conference website.